I am an italian girl, born and grown up in Germany, enjoying the beauty & delights of Zurich since I arrived in 2010. I like food in all it's facets and this also includes spending time with my friends and family! Why did I decide to create this map and what is it all about? Due to a chronical autoimmune disease I needed to change my whole nurishment habits some years ago. It was hard to learn what was safe food, to find gluten free products in the supermarket and of course say no to the food I was used to. Explaining the whole story to family, friends and strangers was always difficult. Eating out is all about explaining your needs, hoping to be understood and trust in whatever happens in the kitchen. I struggeled a lot with eating out. But now with years of experience, I have gathered a lot of knowledge on where to eat safe. So I wanted to share this know how with you, to give you a little peace of mind. Every location contains detailed information. When clicking on one of the pins on the map the information appears on your screen. Most of them I personally experienced, so I added information whether they had a special menu wit allergen declaration. In any case do not forget to inform the waiter about your food restrictions. For coeliacs: Please look at the flag "IG Zöliakie approved" and go to those restaurants as they are members of the IG Zöliakie (celiac association of the german speaking part of switzerland). In any case do not forget to always communicate your nutrition restrictions, allergies to the waiter. 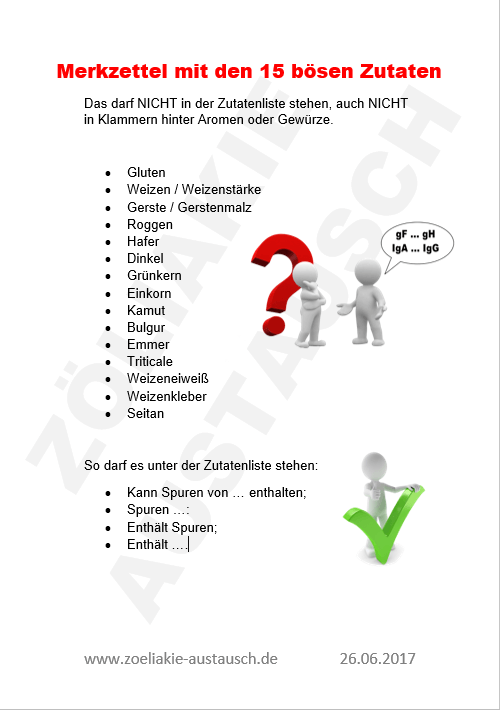 For other restaurants it is always helpful to have a multi language handout for the chef (German & English) with you (by DZG Deutsche Zöliakie Gesellschaft). Moreover I highly recommend you to print out the list of 15 bad / gluten-containing ingredients (in German by Zöliakie Austausch). Do you like the map? Share your experiences with me. Please send me your feedback via mail. To check how many people visit this website I use common tracking tools. Is it ok with you? Further information can be looked up here.